Grandma Emma turned 85 on February 12th. If her brother Bubs was still alive, he'd be 85, too--they were twins. 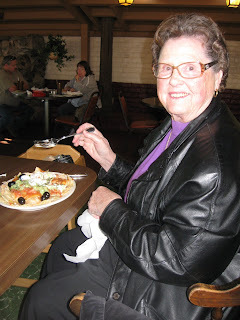 Grandma, ready to dig into her Super Nachos. 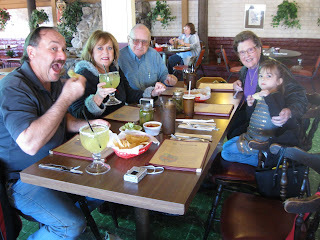 My dad took us all out for an early dinner today at El Tecolote, a little Mexican restaurant right off the 101 freeway in Camarillo. Celebrating special occasions here is a tradition in my family that dates back to the 1960s when Combo #1 only set you back 75 cents. It isn't fancy by any means but it has been there a long time and holds many happy memories for my whole family. 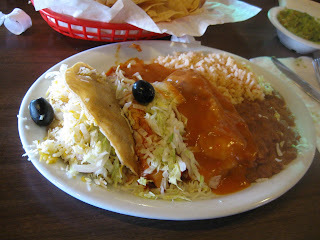 My dinner: Combo #2: ground beef taco, cheese enchilada, chili relleno. I eated it all gone. 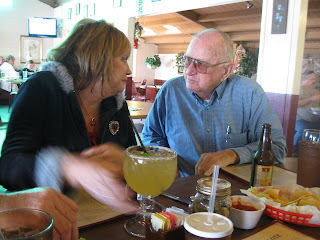 Dad, Debbie and I had Cadillac Margaritas and Grandpa had a Dos Equis. 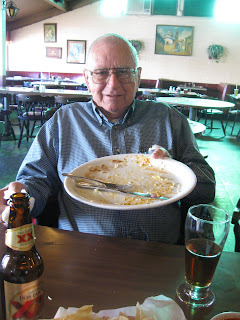 Grandpa had his usual Combo #1 and ate the entire thing. I've never seen him do that! 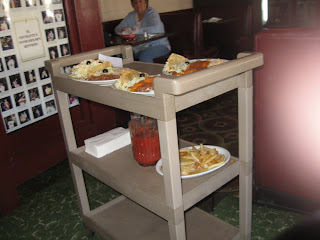 Dinner delivery system: (also notice the salsa dispenser) Maxine woke up when we finished eating. 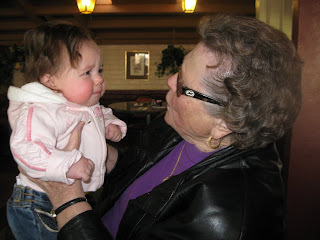 She was scared of everyone, not just Grandma. It was a long drive and Maxine slept the entire time and didn't wake up until we finished dinner. That was nice for me! Then we all went to Grandma's house to drink coffee and eat cookies and cake. Grandma had a bunch of things ready to donate to the Salvation Army but she let me pick stuff out that I wanted. I took home several LPs, some dishes and a Roomba that just needs batteries--I've been wanting one of those! She gave me another old charm bracelet to gift to Maxine when she graduates high school. She also gave my dad a handmade crib coverlet that was made by her grandmother when she was pregnant with my dad. Grandma has kept so many nice and interesting mementos. Thanks for hauling us girls in your truck, Dad, and thank you Grandma for letting us celebrate your birthday with you in such a fun way! how can anyone stick to a diet in california, when you're surrounded with such good mexican food. Those dishes look so freaking good lol. I knew if anyone would appreciate that food pic it would be YOU! FYI, I weighed in today and have lost another 2.5 lbs. My face suddenly looks thinner to me. I'm finally SEEING a difference! oh man. i wish i was there! I would have ordered the "green chilli verde". hmmmhmmm. and maybe a margarita (or 2). Happy birthday grandma emma. I didn't know she was a twin! Wow.